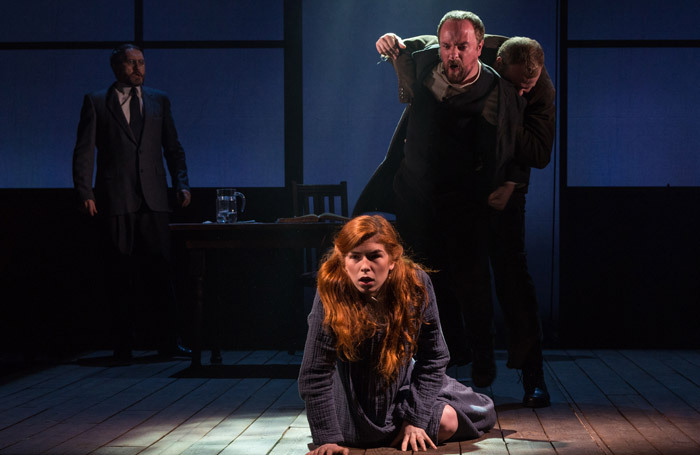 Famously written as an allegory for the McCarthy era witch hunts against perceived Communists in America, Arthur Miller’s The Crucible now stands as a rallying cry against all kinds of hysteria in public life, disinformation and the spreading of false facts. Seeing it again in a week when the 45th President of the United States cited a terrorism event in Sweden that never happened the play could not be more prescient or timely. It is also magnificently timeless, too. Director Douglas Rintoul, in a new clear-headed, clean and unflashy production, doesn’t underline those contemporary parallels (save for in his own programme note); he doesn’t have to. The play simply speaks for itself, through the churning conviction of its playing. Anouk Schitlz’s impressive three-sided steel frame, with wood panels surrounding a low onstage platform that endlessly reconfigures, contains the action effectively, while Rintoul’s other innovation is to provide projected displays of some of the original stage directions to provide dramatic continuity. This is an actors’ play, and Eoin Slattery’s John Proctor presents the thrilling charge of a man being true to himself even if it will cost him his life. Jonathan Tafler’s Judge Danforth is no less fully-charged with ill-placed righteousness, while Lucy Keirl, as the falsely accusing Abigail, and Augustina Seymour as Mary Warren, bring intensity and vulnerability to those conflicted roles. It’s good to see Hornchurch’s Queens’s Theatre putting itself back on the map for serious theatre, seriously done, in a production that will also take its work beyond Essex to a national tour with Sell a Door.